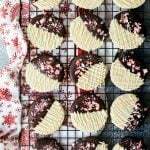 Sweet Sugar Cookies covered in dark and white chocolate with candy cane sprinkles on top! 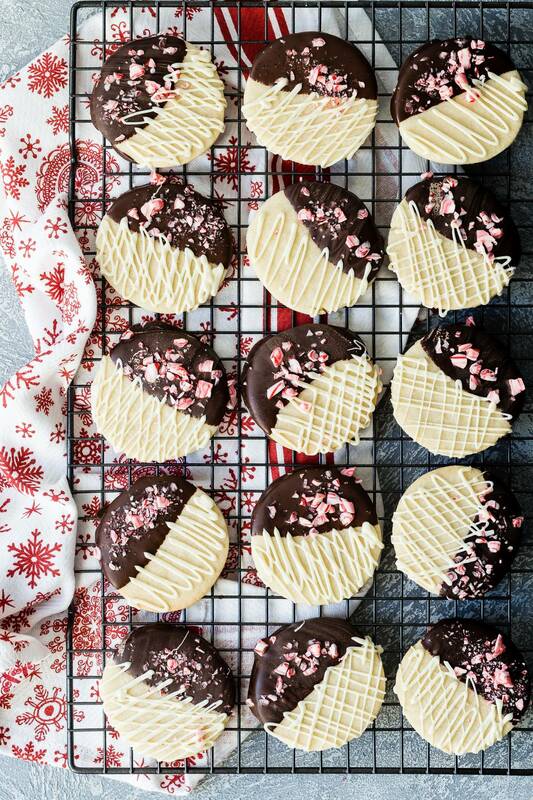 These are perfect office party Christmas cookies! Oh man, It’s only three weeks until Christmas!!!!! I have no idea where 2017 went, did I sleep through it or did one of my kids press something on the DVR and we fast forwarded through the past 12 months? 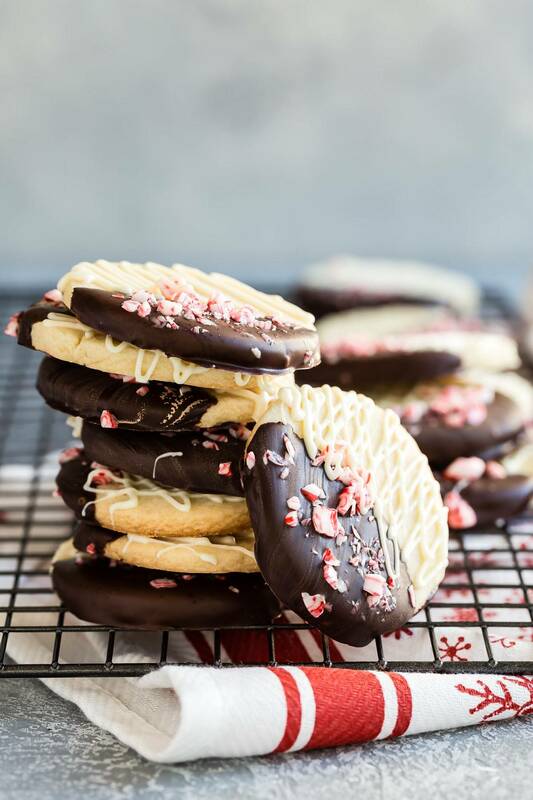 It’s been a super busy year packed with all sorts of different foodie holidays, but Christmas will be forever known for its cookies and anything peppermint. And made these simple sugar cookies. Half of each cookie was dipped in dark chocolate and sprinkled with crushed candy canes and the other half drizzled with white chocolate. Being really bad at making decisions was the reason for this chocolate combo. These cookies are perfect for easy transportation so throw some in a tin and send them to Grandma on the other side of the country, or use them for a cookie swap. Wrap them in bags and surprise your neighbors or hello…teachers love cookies too! Whatever you end up doing with them…make sure to save some for yourself! 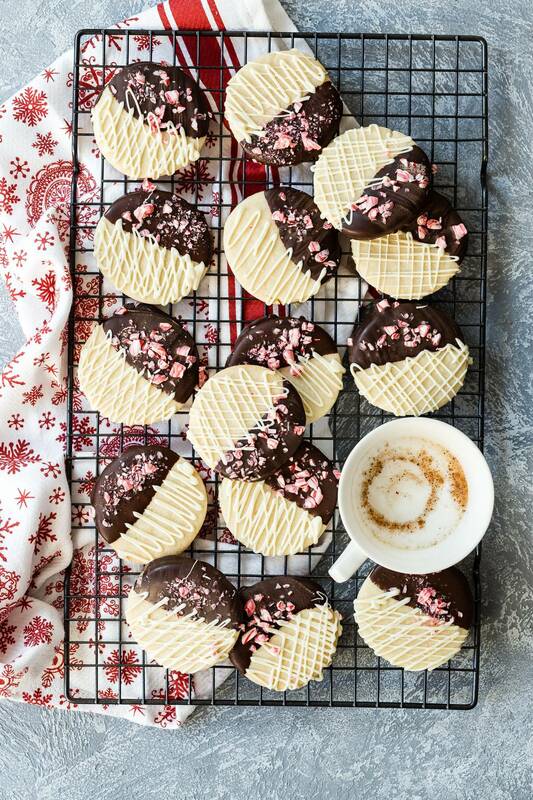 Sweet sugar cookies covered in dark and white chocolate. Combine the flour and baking powder in a bowl. Using a hand or stand mixer, beat the butter and sugar until creamy and light. Add the vanilla and egg and beat for a further 2-3 minutes. On low speed gradually add the flour until the dough forms into a ball. Cover with plastic wrap and chill for 30 minutes. Cut the dough in half and using a rolling pin, roll the dough out on a well floured surface until about 1/4 inch thick. 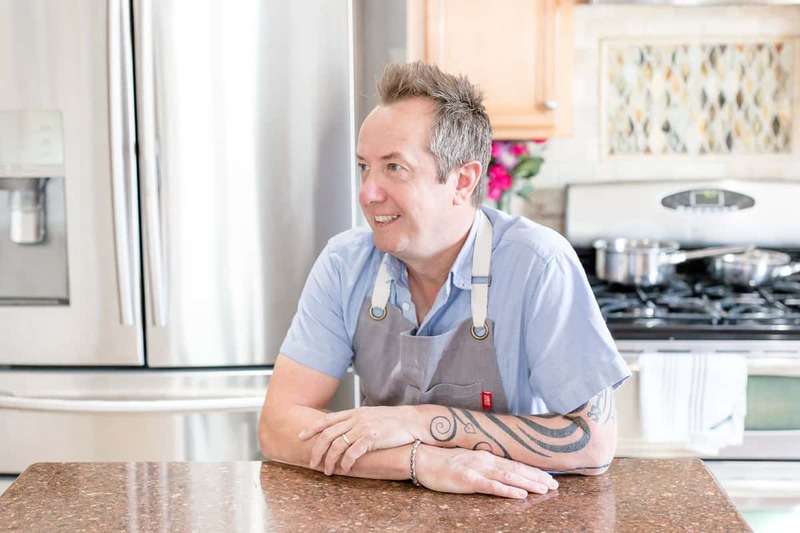 With a 2-3 inch cookie cutter, cut out circles from the dough and transfer them to a baling sheet lined with parchment paper. Repeat until all of the dough has been used. Bake in the oven for 13 minutes and then let cool while you melt the chocolate. In microwave safe bowls melt 1 1/2 cups dark chocolate chips in one bowl and 1 1/2 cups white chocolate chips in another. Dip one half of each cookie into the dark chocolate and place back onto the parchment paper. Sprinkle some of the crushed candy cane on top of the chocolate. Drizzle the un-dipped half with the white chocolate. So gorgeous! I love that they’re chocolate dipped. gorgeous Gerry- I love how these have the best of all Christmas Cookie worlds! PRETTIEST COOKIES EVER. I’m ready for holiday baking! OMG don’t remind me how close christmas is. Instead, feed me! Love these cookies, and cheers to double chocolate! These look fabulous, how many does the recipe make?